Here’s my sure-fire way to test if a new picture book sings. I read it to my daughter. She’s a tell-it-like-it-is sort of girl. If it’s boring, she’ll let me know flat out before moving on to other things. When Olu’s Dream (HarperCollins, 2009) arrived, she excitedly checked out the cover. She flipped through the pages. “Can we read it now?” she asked. We read the story three times that day. And have read it even more since. We are proud to have Evans, an accomplished illustrator and 2008 28 Days Later honoree, back at The Brown Bookshelf to talk about his authorial debut. Congratulations on your new book, Olu’s Dream! On your site, you say it’s the culmination of 10 years of work. How did the seed of the idea bloom? The idea for Olu’s Dream was truly seeded out of life. I was recognizing the blessings in my life and how all of the love that has been around me since I was a child has helped me to live my dreams, not only live them but realize the importance of having them. There are ups and downs in life and with LOVE as a base you can make the adjustments needed to get past the worst lows. I have never been the type of person to compare the struggles of one person against another but it would be fair to say that we as a whole are made of up of stories. That there are things that we can learn from the struggles and the triumphs of others that can get us through. As I started Olu’s Dream, I held onto the premise that we all dream and it is important to who we are. It took 10 years to create and when I began the process the story was not NEAR complete because I was growing as a person and as a storyteller. All of the life elements took time to fall into place so that Olu’s Dream could be as REAL as possible for those who read the book. You’re a beloved illustrator, but this is the first picture book you authored. Have you always loved to write? What was it like writing Olu’s Dream? Let me start by saying I am honored to be coined a “beloved illustrator.” I have always loved to write although I have to be honest there was a time in middle school where I was discouraged by a teacher about my ability to write … I will expound on that just a bit… First, I will say in reflection I don’t think that the teacher had malice but every person responds to criticism differently and it was something that she said that made writing feel like a HOT SURFACE that burned me and I was cautious every time I touched it. I think that stuck with me for YEARS. I would say that it stuck with me all the way to college. I recall breaking the notion when I took a writing course at Syracuse University. We had an assignment to read some short stories and write a piece on one of the works. I took (what I felt) was a creative approach to the piece, and ironically, I got like a “C” on the paper… but it was something about that “C” that motivated me because what I wrote about for me was TRUE… it was HONEST. I actually wrote about a character in the short story that HAD NO VOICE, essentially the character appeared for a moment and then left the story. The character happened to be a black butler… there was something that struck me odd about his inclusion in the piece that his brief mention must have meant something or the author would not have included him, but we NEVER talked about him in class. I thought it was more than relevant and I wanted to tell his story. Now most would look at that “C” as a failure but it was that grade that made me say, this is MY VOICE and this is what I want to say with it and that was when I truly started to write/express in words. Please tell us about your journey to publication. What were the struggles? What were the joys? Writing Olu’s Dre am was like trying to summarize all of the joys of my life into a book for children, that is NO EASY TASK. It took time, patience and compromise, but I would say that it opened the door to a milestone much like the “C” where another level of honesty came into view. The journey was a long one and there were times where I was not so patient but I see in retrospect that it needed to go through this process to be an honest journey. The struggles came in the learning process of writing for this medium. When you write for yourself you have no boundaries. When you are writing for books you are often acknowledging a long tradition and this is something that has to be honored and respected. I have been working with Harper Collins and Katherine Brown-Teegan for many years on illustrated books so we took the needed time to adjust to me tackling a written and illustrated piece. It was a process that I can say I learned a lot as I watched this story COME TO LIFE! In your book, Olu has biracial heritage — African father and Asian mother. Why was it important for you to celebrate that cultural diversity? The celebration and recognition of a multicultural story line was important for so many reasons. When you look out into the world today we are seeing stories combining EVERYDAY. I define culture as the fabric of a people held together by the thread of stories… so when we look at the “cloth of the world” we are starting to see a “quilt” of sorts. It is not about “race” and I want to make that distinction, as race is often a construct that divides us. It is about STORIES… CULTURE covers our world. So we look at 2 people from 2 distinct stories that come together and have a child. The amazing thing is that this child is now blessed with so much information and knowledge and that is what makes us as human beings so rich. Just look in the WHITE HOUSE! We are living in a world where our stories are crossing every day and that makes living in this time and space dynamically interesting. Olu’s father plays a sweet role in the story. What inspired you to focus on their relationship? My inspiration for the role of the father has many layers. One of which is the father-child relationship is not honored enough in stories. I know so many engaged and caring fathers and that is such an important structure to a family worldwide. What mothers and fathers bring to the table is so dynamically different and it is through that balance that a child feels a full spectrum of love. There are many families who are missing the father figure in the traditional sense and showcasing the father-child relationship in the empowering of dreams, even in this subtle way, was an important first step in this series. Olu goes on amazing adventures with his teddy bear sidekick Brindle. Do you have a favorite of his adventures? My favorite adventure is Olu and Brindle finding themselves stuck with monsters in a room. There is a moment of fright and then they RUN like the wind… What is important about this moment is that they get away from what scares them, but there is a moment later in the book where Olu and Brindle actually TRIUMPH over this fear in the BIG RACE! Monsters may find their way into our dreams, but we can beat them if we focus on our goals. What do you hope kids take away from Olu’s Dream? I hope that children of ALL AGES take away from Olu’s Dream that dreaming is vital and through what we imagine we can live our dreams in our everyday lives. What response have you received from children? from adults? The response to Olu’s Dream from children and adults of ALL cultures has been incredible. I participated in the 14th annual Kennedy Center Multicultural Book Festival where over 20,000 people visit in a 6-hour period. I could see the eyes of families light up as they were introduced to the book and the character. I was able to read and perform the theme song to many families that came that took the level of interest over the top. I have had fathers reach out to me and share the impact the story has had and how elated they are to share this book with their child. That means a great deal to me. Olu’s Dream inspired the name of the studio you opened in Kansas City in 2007 — Dream Studio. Could you please talk about that? How has your studio grown since it’s opening? What about it makes you most proud? What’s your dream for its future? Dream Studio has been a place of great growth and a place to help evolve the dreams of others. I have seen that by living your dreams the importance of helping others to fulfill their dreams and we look to build on that concept at Dream. We have hosted artists from all over the world. We have featured great performances, visual art and opened the doors to community. Art had a tremendous impact on my life and it is important that I can share that impact with all. In the short time that we have been open, we have watched our guest book grow and grow and watched families return to multiple events knowing that Dream Studio is a place to share with their children. I am most proud when I can look out and see a five-year-old in AWE as a musician sings from their soul or a 10-year-old expresses how they love to paint and create books. That is truly rewarding. My dream is to continue to grow and share this work world wide, and move this concept model into neighborhoods all over the nation and all over the globe. I read that Olu’s Dream will be a seven-book series. When will the next adventure debut? Could you please give us a sneak peek? The Olu’s Dream series is already underway. I have plotted out all seven books that introduce 6 new dreamers and 6 new sidekicks. In the seventh book, all of the characters who are introduced come together in an EPIC dream. The total work is an important piece that will show how we can ALL work together through our dreams. Next is to continue the hard work and to share stories both visual and written that inspire. I have a number of projects coming out that I am very proud of — more stories that I have written and illustrated and working with some wonderful authors like Holly Robinson-Peete, Taye Diggs and Charles Smith Jr. on books that are wonderfully dynamic. What’s your dream for Olu? What’s your dream for children around the world? My dream for Olu is that the stories reach the world, that this voice is translated into hundreds of languages and that both young and old will awaken their dreams through this work. I dream that children worldwide are able to listen to their dreams and follow them to reality and utilize that inspiration to change the world. Olu is drop dead adorable. Great interview; always good to hear about more books for the nephews! I loved Olu’s Dream, so I was very exicted when I saw this interview. Olu’s Dream is getting my Cybils vote, if no one beats me to it. Great interview, Kelly! The artist looks a lot like his creation! 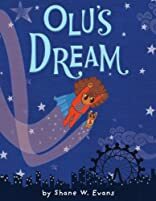 Wow -we really enjoyed reading Olu’s Dream and have been waiting patiently for it to be published.This book really has inspired me to live my dreams!Fantastic illustrations! Yes, I agree with Elliottzetta -Shane does look alot like his creation!It is so great that you are planning a series of 7 more books to follow up on Olu and his friends(we call them “The Crew”)and their adventures! !